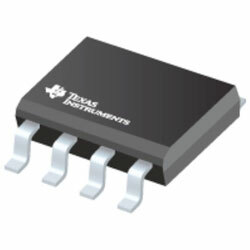 Texas Instruments OPA828 JFET-Input Operational Amplifier is the next generation OPA627 and OPA827 op-amp, combining high speed with high DC precision and AC performance. This op amp supplies low-offset voltage, low bias current, low-drift over temperature, and low noise with only 60nVRMS 0.1Hz to 10Hz noise. The device operates over a broad supply-voltage range, ±4V to ±18V on a supply current of 5.5mA/channel (typical). AC characteristics, comprising a 45MHz gain bandwidth product, a slew rate of 150V/µs, and precision DC characteristics, make the device an attractive choice for a variety of systems. These comprise high-speed and high-resolution data-acquisition systems, such as 16-bit to 18-bit mixed-signal systems. It also includes transimpedance (I/V-conversion) amplifiers, filters, precision ±10V front ends, and high-impedance sensor-interface applications. Typical applications include DAQ, Optical Module, Seismic Test Equipment, Mixed Module, and Ultrasound Scanners.